Learn Italian in Venice at our partner school Istituto Venezia, which is located in the centre of a popular Venetian square, Campo Santa Margherita. The Italian school is housed in a historical building with a large terrace. Taking part in the school\'s activities whilst you learn Italian in Venice, is not only a great way to explore the city but also improve your Italian language skills! 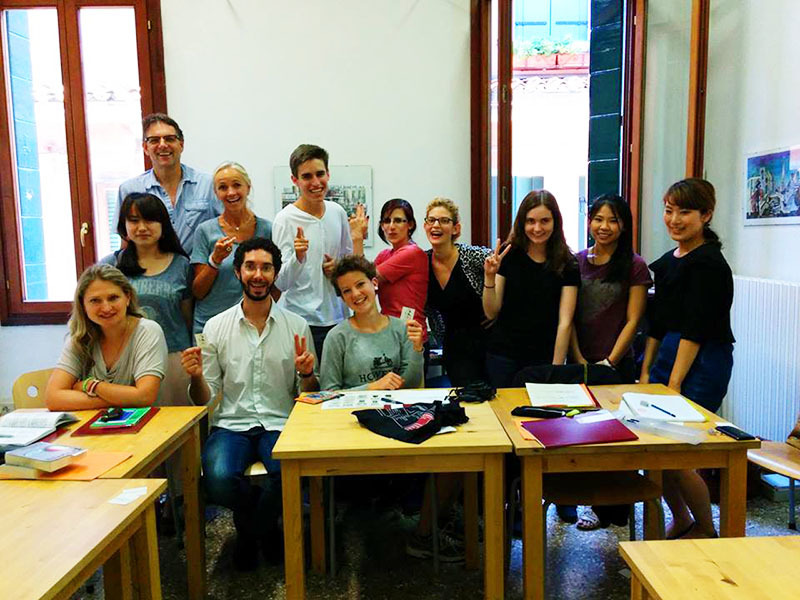 Learn Italian in Venice by taking an intensive Italian course. Intensive course classes are held each day from Monday to Friday, 4 lessons a day. According to your Italian level, you can acquire a basic knowledge of Italian or deepen and perfect the knowledge you already have. A double room can be only booked for 2 people travelling together. Transfer on arrival at the Marco Polo airport between 8 a.m. and 11 p.m. (an airport transfer from Treviso is not possible). You go accompanied to Venice by public transport. There is a surcharge of € 10 in case of delay (to be paid on site). This intensive course consists of 20 hours per week is only available from April to October and it is highly recommended for students with a low budget. Classes are held from Monday until Friday from 16.00 until 20.30 hours. This course has a more favourable price than the intensive course with lessons in the morning. Small classes (maximum 12 students) guarantee that you will receive a high level of personal attention and maximum learning opportunities. Minimum course length is 1 week. The combined course is designed for the student willing to intensify Italian language learning. This course consists as a combination between the intensive course in the morning and the individual course in the afternoon. Italian food will not be longer mystery with this Italian cooking course in Venice, which combines 20 lessons of the Intensive Italian course with 1 afternoon cooking class. Every Thursday in the afternoon in the school's kitchen and supervised by our talented cook Anna, students will prepare traditional local and regional food and taste them with a good glass of wine. On Thursdays from 5.00 pm to 8.00 pm (this course is available all year round, except on public holidays falling on Thursdays). The cooking lessons take place every Thursday (17:00-20:00hrs) in the school, except on public holidays. This course combines the Intensive Italian course of 20 lessons with a Cookery course on Saturday. On Saturday morning, you will go shopping at the famous fish and vegetables market in Rialto and you will taste a local aperitif. During the afternoon you will cook the meal and in the evening you will have dinner all together, serving food with an excellent selection of regional wines. This course can get started with a minimum of 4 students. Cookery course on Saturday: This course can get started with a minimum of 4 students. The Art course will introduce you into the rich history of Venetian Art. The course takes place from Monday to Friday and the lessons are held in the morning or in the afternoon for three hours (15 hours a week), according to the opening-hours of museums, palaces that are included in the weekly programme (presented during the first day at school). Students will get to know and appreciate the masterpieces of the greatest Venetian artists in painting, sculpture and architecture from the middle-ages to the contemporary age by visiting the places they were designed for. Since the lessons are held in Italian and since they deal specifically with Venetian art, history, culture and traditions, an intermediate level of knowledge is required (B2 of the European framework). Art group courses are not for complete beginners. A course where the participants define their objectives to create an individual programme adapted to their level and learning pace. The duo course is a class for two students. This course can only be booked by two people who travel together and have the same level of Italian. The one-to-one course includes exclusive attention from your teacher, to learn at your own pace according to your own needs. 15 or 20 lessons per week. If you want to stay in a very special accommodation, you can book a single or a twin room with private bath in one of the most charming cloisters in the city. The residence is located in a ancient wineyard in Giudecca with hundreds of olive trees. It has 23 rooms with view, wi fi access. You share the kitchen and comfortable TV rooms and can make use of laundry machines. Giudecca is the ideal place if you want to be near the historical centre, in a fashion area among students and artists, controlling accommodation expenditure. Giudecca is the picturesque island in front of the Zattere; a continuous waterbus service links the island to the historical centre and so it can be also reached easily from Piazzale Roma and the railway station. In Giudecca you can find some of the artistic masterpieces of Venice, such as the Redentore church and the Molino Stucky. You can stay in an apartment in a single room and share the kitchen, bathroom and living room with Italians. This can be a single person, couple or family. It is the best way to enjoy daily life and improve your linguistic skills. In the apartment you can find all that you need; bed linen, washing machine, TV. Staying with Italians is the ideal solution if you don’t fear immersion in a language different from your own, and you want to have an experience that will definitely enrich you culturally. Double rooms are only available for students who enroll together and attend courses during the same period.